Just a glimpse inside the package sent to me by Tactical Paintball. Not pictured is a thank you note saying, "Thank you for shopping at tacticapaintball.ca". 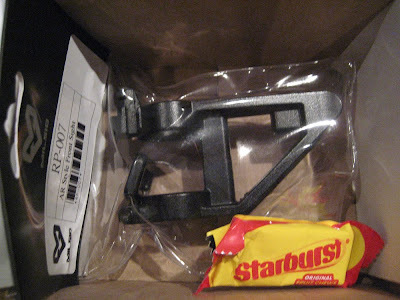 I'm not sure if the Starburst was an apologetic offering for a very delayed backorder or just keeping with the Halloween spirit (I received it November 2). In any case it was a nice surprise and gave me the needed energy to widen the inner diameter of the front sight so it could fit my barrel :P.